We offer CNC machining on 3-axis, 4-axis and 5-axis platforms, mills and lathes so we can deliver quick turnaround for prototypes, parts and master patterns for critical tolerance applications. Our advanced technology rapidly analyzes your 3D models and programs our CNC machines to produce your parts exactly as designed. Speed and quality guide our CNC machining service. At PartWorks, we manufacture parts quickly, but with high quality standards. We use engineering-grade plastic and metal materials for improved selection, part functionality and cosmetic appearance. Our network of manufacturers can deliver 3-axis, 4-axis and 5-axis milling solutions. 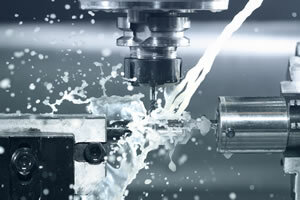 And the turning process can include live tooling to create off-axis holes, flats, slots and grooves. With our strong manufacturing heritage, you can rest assured that the parts we deliver can be used as high-quality prototypes, jigs, fixtures, one-offs or in end-use applications. Let PartWorks handle the design and sourcing of your CNC machined parts. Contact us today to discuss your needs or request a quote.